The Museum has digitised one of its biggest archives of British Army records. These are now available to search online via family history website Ancestry.co.uk. In partnership with online family history resource, Ancestry, the National Army Museum has made available the Army Registers of Soldiers’ Effects, 1901-1929. 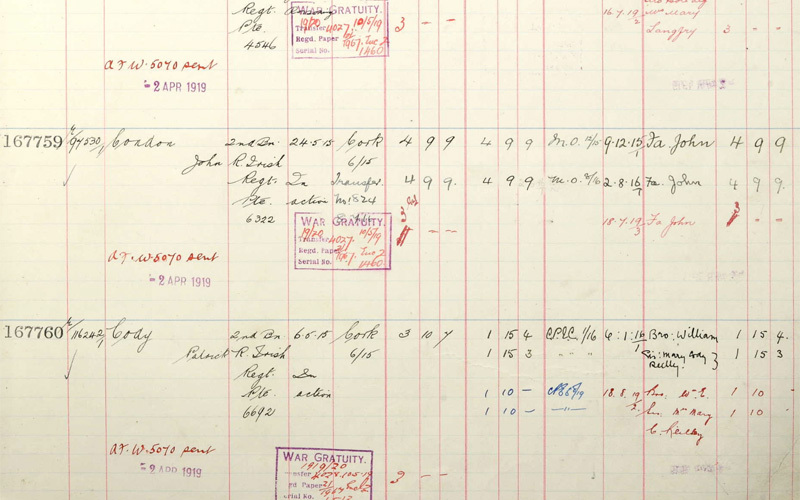 These records detail the money owed to soldiers of the British Army who died in service during a period that includes the end of the Boer War and the First World War. Created by the War Office, they reveal the financial compensation given to the families of 872,395 peacetime and war casualties. They also provide details of the individual’s next of kin, who would have received the payment. This is particularly helpful for researchers looking for evidence of family links. The records include information about well-known military figures from the First World War. Second Lieutenant Walter Tull was a professional footballer, who played for Tottenham Hotspur and Northampton Town. He was also the first black man to be commissioned as an infantry officer in the British Army. Killed in action in 1918, his entry shows that his brother Edward received £15 from the War Office. Another listed soldier, believed to be the youngest battle casualty in the First World War, is Private John Condon. The records show that his father John received just under £5 following his son’s death at the age of 14. Also known as the ‘Boy Soldier’, his distinctive story is one of many that demonstrate the personal and emotional impact his death would have had on his family. The effects records allow family and military historians to gain insights into individuals who died during Army service. They are also a reminder of the sheer number of casualties, and the accompanying grief sustained by British families, during the First World War. Explore the Army Registers of Soldiers’ Effects, 1901-1929 at Ancestry.co.uk.